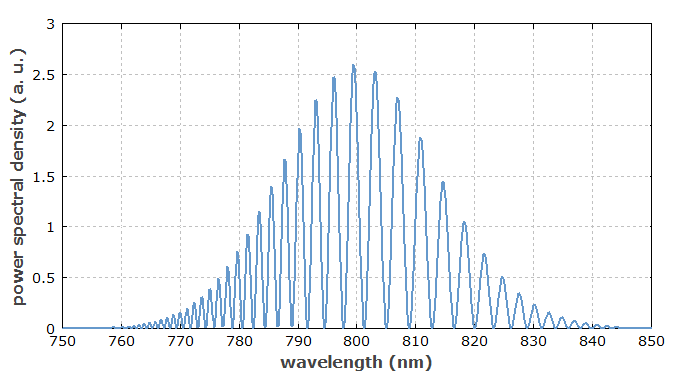 The intensity profile of the optical spectrum of a signal, such as an ultrashort pulse, can easily be measured using some kind of spectrograph. For the more difficult task of retrieving the spectral phase, methods of Fourier transform spectral interferometry (also called frequency domain interferometry) provide various options. which shows that there is an oscillation determined by the time delay, the phase of which is also influenced by the difference of the spectral phases of the two pulses. It is now possible to characterize an ultrashort pulse, if a reference pulse with a well-characterized spectral phase is available, the spectrum of which covers the full range of the spectrum of the pulse to be characterized. The time delay is chosen such that the period of spectral modulation can be well resolved with the given spectrograph, but is fast enough for an accurate phase determination. The phase of the recorded spectrum can be conveniently and precisely obtained with Fourier transform methods, applied to the spectral intensity curve. Figure 1: Spectrum of two femtosecond pulses, where one pulse is nonlinearly chirped and delayed by 600 fs. The spectral modulation can be used to reconstruct the spectral phase of the chirped pulse. A high sensitivity can be achieved, as such a heterodyne method works well even if the signal pulse energy is much lower than that of the reference pulse. Also, no nonlinear crystal is required, thus avoiding possible bandwidth-limiting effects. Finally, an accurate intensity calibration of the spectrograph is not required, since only the fast modulation of the spectrum is of interest, not the slow variation of intensity. However, the need for a suitable reference pulse is clearly a disadvantage. where the approximate relation holds if δω is not too large. This shows that the spectral derivative of the phase of the signal pulse can be obtained, which is the frequency-dependent group delay. This method, called spectral shearing interferometry [1, 10, 11], works well for relatively long pulses. For very short pulses, where the group delay variation within a pulse duration is small, it is difficult to obtain a sufficiently large spectral shift in the modulator. 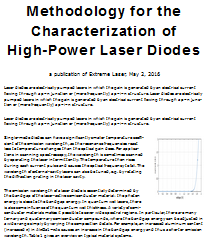 A larger spectral shear can be achieved by using a nonlinear interaction, as discussed in the following section. Another method of spectral shearing interferometry, often applied for the complete characterization of ultrashort pulses, is called Spectral Phase Interferometry for Direct Electric-field Reconstruction (SPIDER) . Here, the signal pulse is split into two identical copies with a significant temporal distance, so that there is no temporal overlap. Another pulse, derived from the same input pulse, is strongly temporally broadened by sending it through a highly dispersive optical element, such as a long block of glass or a pair of diffraction gratings. 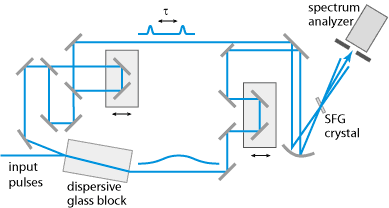 Figure 2: Setup for ultrashort pulse characterization with the SPIDER method. The long chirped pulse and the two copies of the signal pulse are then combined in a nonlinear crystal, where sum frequency generation occurs (see Figure 2). The two signal pulses overlap with different temporal portions of the chirped pulse, which have different optical frequencies, so that there is also a spectral shear between the two upconverted pulses. Therefore, the optical spectrum of the sum frequency signal reveals the temporally resolved group delay in a way which is analogous to that discussed above. From the group delay, it is easy to retrieve the frequency-dependent spectral phase, so that complete pulse characterization is achieved. SPIDER does not require a sophisticated iterative algorithm for retrieving the spectral phase. Its simple algorithm can be executed very rapidly on a PC, allowing for fast update rates which are limited only by the speed of the spectrograph, even for complicated pulse shapes. However, the FROG algorithm has the advantage of delivering additional consistency checks. Both methods can be applied also for very short pulses with durations below 10 fs. FROG then relies on the accurate calibration of the spectrograph in a wide wavelength range, whereas SPIDER requires only precise wavelength calibration, which is simpler to obtain. However, it may anyway be desirable to know the spectrum precisely. For long pulses, FROG is more convenient, since SPIDER would require a spectrgraph with very high resolution, and an optical element with a huge amount of chromatic dispersion. Both methods have variants which allow for single-shot measurements. A comprehensive comparison of SPIDER and FROG techniques is difficult, because there are many variants of both methods, which have specific advantages under certain circumstances.